One of the best things about working for a “Web shop” like Critical Mass, is that we actually get to conceive, design and build the kinds of online applications that the big brand agencies are still mostly talking about. “Branded Utility” has become an elusive phrase within the industry where few case studies actually exist. Nike + and The Dominoes Pizza configurator offer glimpses of the promise of brand utility which loosely translates to the opposite of advertising, as it has very little to do with messaging or articulating a brand’s promise. Instead, branded utility offers some kind of functionality to an individual, group or community that serves some type of purpose whether it be rational, emotional or ideally both. This begs the question—what if we could get Vegas visitors excited about their upcoming trip and allow them to build anticipation with friends before actually going? And what if they had a place to share “war stories” after? The experience at this point offers two core features. My Vegas is sort of a “Facebook light” for you and your “entourage”, while the RSVP tool (Really Simple Vegas Planner) allows you to throw some events on a calendar and coordinate activities with friends. One of the first things you’ll notice when using the RSVP tool is that we’ve broken the traditional “loading page” approach and went with a more “liquid” interface dynamically slides in steps from right to left while displaying a brief “burst” of motion. Why? Uh, because it’s Vegas baby—that’s why. One of the challenges of designing a Web application like this is to get lots of functionality in it it without losing sight of the “fun” part. 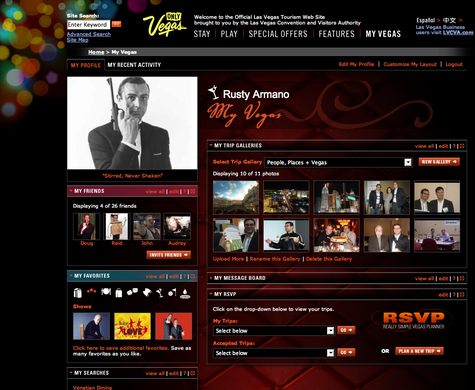 The RSVP tool allows users to plan a trip, and let friends know where they will be staying and what they’ll be doing. After you are done planning your “Vegas getaway”, you can invite as many friends who will be able to see what your up to. Likewise you can do the same with them. For folks who want to connect with friends around a specific event (like an annual trip to Las Vegas) but don’t want the hassle of joining Facebook or Myspace, this might be for them. 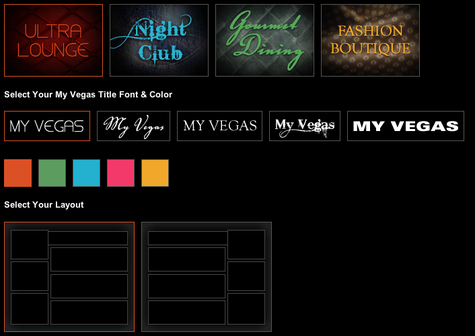 The My Vegas portion of the application is where you can play around and really ham up your “Vegas persona”. Here you can see that I’m “Rusty Armano”. But I can change this to be pretty much any over-the-top character I want to be (over 100 to choose from). There are no advertisements on My Vegas, instead I can show my “entourage” what I like by choosing venues, events and restaurants in the area that I like and plan on checking out (I want to see Cirque’s new Beatles show). In the age of influence, we pretty much know that this is the best kind of advertising there is. It’s called word of mouth. There are also a few nice touches like customizable layouts and themes which can be quickly configured to meet your personal tastes. It’s pretty quick to get a profile set up and like most social applications, you can invite people who you know to be a part of it. So here’s where I need your help. As I mentioned earlier, the Web application recently launched and we’ve got lots of refining to do as well as enhancements. If you are a regular reader here—I’d like to ask the favor of checking it out and putting your recommendations in the comments area here. Where do you see UI improvements? Whet’s not working? What are ideal enhancements (mobile integration, integration with desktop applications like excel etc?). I really want to know as I’m doing a bit of an experience audit. Lastly, I will be using my profile on my Vegas to post all of my pictures and some updates for Microsoft’s upcoming Mix 08 which is taking place in Vegas. If you want to be part of my “entourage”—set up a profile and then send me an invitation to this e-mail address. I’ll add you back and we’ll be be up to no good in no time. See you in Vegas! (or at least on My Vegas).